Donna and the Bears: COVER BOY!! Oh wow, that is one seriously cute tiny fairy... and what a wonderful photo! I enjoy photography almost as much as making bears so was delighted that one of my photos was used. Can you imagine how hard it is to balance a little bear on a hydrangea??? Thanks for writing, Heather!!! Hi Donna, Congratulations :-) your cover is beautful, I love that little guy, I've not read your article yet but I'm very much looking forward to having five minutes to! Thank you so much! I KNOW you understand exactly how it feels. I'm honored to follow you on the cover!!! Congratulations, Donna! What a cute bear, and the photo is superb. I hope I can find the magazine near me so I can get a copy! Thanks so much, Debbie! If you can't find a copy let me know. I've ordered extras! You can email me at Donnaandthebears@AOL.com and give me your address. Your bears so adorable and when if not in Spring this Fairy Bear make you smile. Hello Natalia! and thank you for you kind words! I wish for you a wonderful Spring! Your sweet comment has made me smile!! You're welcome, Debbie! and let me know if you can't find it. 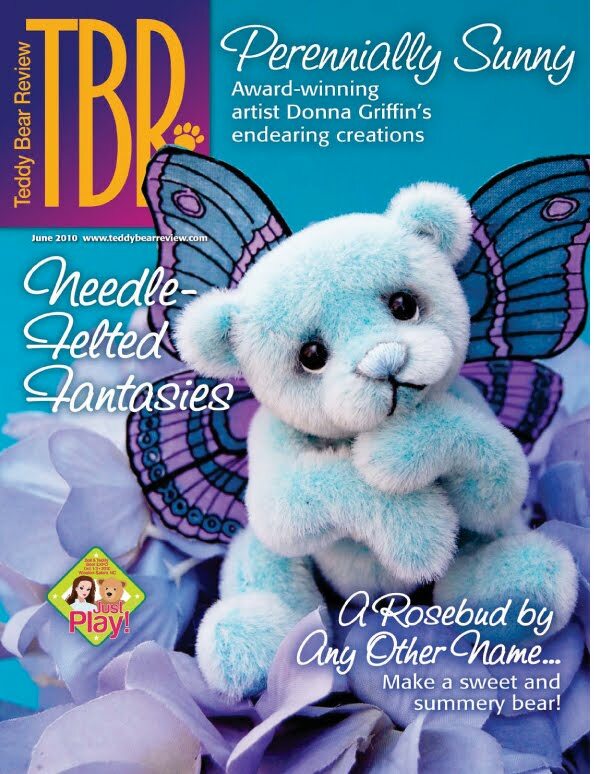 I guess subscriptions are the only sure way to get copies as so many of the bookstores don't carry teddy bear magazines any more...which I think is really strange if you look at some of the titles they do carry! Agreed, Donna! Ha-ha! :-) Dear hubby made a trek to Jo-Ann for me this morning, but no success on TBR. I'll e-mail you. I'll check for it, Debbie! We need to support those publications! Donna, I was so excited when I saw your beautiful bear was on the cover of the upcoming TBR. The photo is just gorgeous!! I can't wait to get my copy to read the article. Hi Carolyn! and Thank You! I'm so glad you like the photo. I submitted several (the tiny bear was sitting on different flowers) and was glad when this one was picked! It was my favorite. Thank you for writint! Congratulations Donna - what a spectacular photo! Beautiful little bear ... wish I could see the article. I've learned some lessons about balancing little bears on flowers! Little Oliver finds a home! Sneak Peek for Oliver with wings!! Hello, I'm Oliver! Can you see me??? ?